This weekend was a great one for Isabelle. She started it off by scoring two goals in her soccer game on Saturday. Then, after an afternoon of battling psychological demons, she learned to ride her bike with no training wheels. It was actually Henry who wanted to have his training wheels taken off and there was no way Isabelle was going to let her younger brother learn first. So we took off his training wheels and they both spent the day learning. Henry fell approximately 1.7 billion times and just kept getting up. Isabelle fell once and it took convincing to get her back on the bike. She is always cautious and methodical (and afraid of injuries!). Basically, she is the complete opposite of her brothers! But after some time alone in the driveway, she quickly nailed it and is a riding pro now. Her brother...well he's going to need more work! Then on Sunday Isabelle had her first piano recital. She started taking lessons in February (after I finally cleared off our piano) and has really been enjoying it. 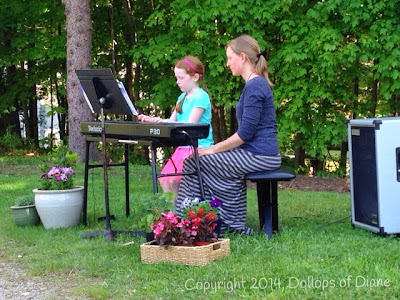 She played two songs at the outside garden party at her teacher's house. She was confident and did wonderful. It was such a nice afternoon and we are so proud of her! It's weekends like this that really show me how much she's growing up. I can't believe she's finishing up Kindergarten already. There's just no stopping her!